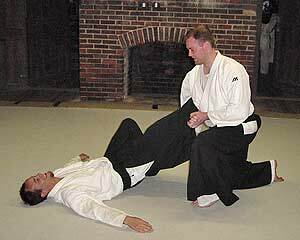 Methods of diving under an opponent’s arms, to grab an ankle or leg and then using body leverage to take the opponent down (sometimes referred to as “shooting”) are found in almost every branch of the martial arts. They are the staples of wrestling, Brazilian Jujutsu, the UFC and other variations of the almost “anything goes” full contact competitions. And if you are in a bar fight don’t be surprised if your opponent resorts to wrestling and some form of attempted low leg takedown too. Low (shooting) takedowns are also found in many Kung Fu arts, such as praying mantis and shuai chiao. 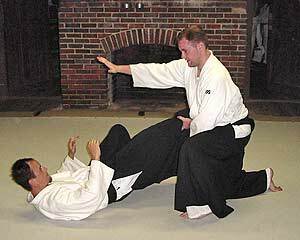 In my own Seido Karate there are also several variations practiced in our self-defense exercises. This type of takedown is effective for several reasons. It can be a surprising move against you, especially if you are startled by an initial technique to the face and you react my leaning back away from the technique. It is also an effective move against an opponent who attacks with a flurry of fast punches. Many stand up fighters just don’t see it coming and are not versed to defending against it. Your experience can also work against you. Several years ago when training in Buffalo, NY with several UFC competitors and other fighters I was surprised how my former Kyokushin training worked against me. I quickly learned that lifting a leg to block a low shin kick to my leg also set me up for a quick shoot and takedown. I had to modify my reactions to take into account this type of takedown. Instead of lifting a leg to block low leg kicks I learned how to also shift and move my body to avoid them. Takedown reflect an old strategy – of faking east while attacking west. Of course it is twisted 90 degrees here -- faking high and striking low. Many karate kata illustrate this principle, such as in Seienchin and Gojushiho (koryogojushiho) where a high back fist downward strike to an opponent’s face masks a simultaneous stomp to an opponent’s foot. 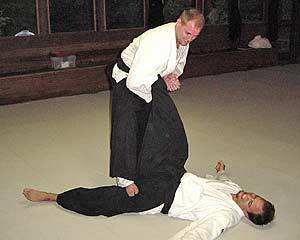 A judo practitioner might use this same principle in self-defense by executing a hand grab while simultaneously sweeping his opponent (the sweep, however, is another permutation of this principle). While variations are many, every martial artist should be aware of and hopefully trained one or more of them. Below Ryan Lynch Sensei of Roy Suenaka’s Wadokai Aikido (Raleigh, NC. ), assisted by Brad Jones, illustrate one method of takedown. This is followed up by a leg submission. 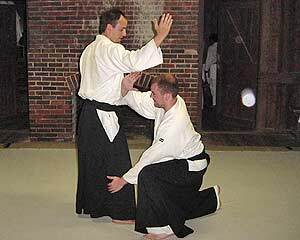 While this is not an aikido technique per se, it does reflect peripheral training. The opponent at left prepares to strike. The type of strike is not important. The defender could also just fake a high technique or punch of his own, then perform the takedown. 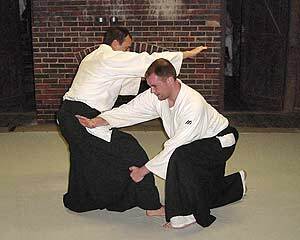 As the opponent steps forward, the defender drops down and inward (left leg forward) onto one knee under the strike. His body erect, the defender’s left hand goes behind the ankle of the attacker’s advancing leg, while his right forearm (bent at 90 degrees) hits into the attacker at waist level. The defender uses his weight and forward momentum to lever (pushing with his right forearm and pulling with his left hand) the attacker backward. Notice that while his lower body is still centered, his upper torso follows into the technique. The attacker is propelled backward onto the ground. Notice that the defender still has hold of the opponent’s right leg with his left hand. The defender’s right arm then moves down, over and then under the opponent’s extended leg, the right hand (palm to palm) ending on top of his left hand (thus encircling the leg and pressing up into the Achilles Tendon (several inches above the ankle) with the upper edge of the forearm). Seen from the opposite side -- the defender rises and while applying upper pressure against the Achilles Tendon the right foot moves forward with his body (as he steps up) to simultaneously press down (edge of his right foot) into the inside of the attacker’s left upper thigh. As this is executed the defender lifts with his back to put extra pressure on the leg – a painful submission. 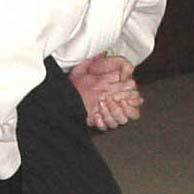 A close-up of the defender’s hand position for the submission. 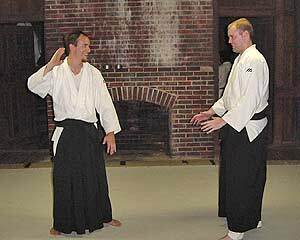 Ryan Lynch began training in Wadokai Aikido in 1994 and is ranked nidan. He has also trained Shorin-ryu karate beginning at age 4 under his parants and is ranked nidan in that as well.